North Shore Shark Adventures will guarantee you spot sharks on your trip! Come back again for free or get your money back. You must choose either to return or receive a refund. Take in the breathtaking views of Oahu's North Shore and get a close and educational encounter with sharks in their natural habitat. When the water turns a deep blue and visibility is up to 200-400 feet, the floating shark cage is lowered and you will have the unique opportunity to enter the very secure shark cage. This thrilling experience offers the chance to encounter Gray Reef Sharks, Galapagos Sharks, Sandbar Sharks, or the occasional Tiger or Hammerhead Shark. Join this tour to experience an adventure of a lifetime! Don't want to go in the water? Passengers who do not want to go into the cage can book the Observer option. This allows passengers to stay on the boat throughout the tour and watch as the sharks swarm around the boat while our expert crew share their knowledge about sharks and other marine life our guests may see. Encounter sharks on the North Shore of Oahu! Please note: This package does not include transportation. Shark diving on Oahu's North Shore has become a staple must-do experience in Hawaii. The cage will keep the sharks at a safe distance and give you the visibility to watch their majestic movements up close. 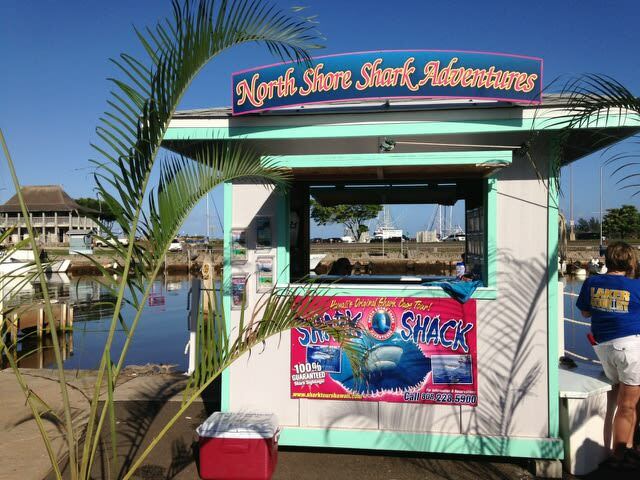 North Shore Shark Adventures "Shark Shack"
Sharks in their natural habitat! Pick-up service is available from Waikiki hotels for the 9:00am and 11:00am tours 7 days a week! Pick-up for the 7:00am tour time is only available on the weekends. Cruise Ship passengers, please choose your accommodation as "Cruise Ship (Aloha Tower Pier)" for direct pier pick-up service. Watch from the comfort of the deck as an Observer & enjoy the sharks without having to get wet! The 6:30am, 8:30am, 10:30am, 12:30pm, and 2:30pm tours are only available if the other tours are sold out. These times are available during the summer months only. The 6:00am, 8:00am, and 10:00am tours with transportation are only available if a minimum of four (4) participants are booked. These times are available during the summer months only. For those who reschedule within 48 hours prior to the activity, there will be a fee of $45.02 per person. A credit or debit card will be required in order to reschedule and is to be paid upon check-in. Children 2 years old and under can ride on an adult's lap for free. However, guests who wish to use their own carrier or child safety seat will have to pay for an extra seat. Staff members will take a video of your shark tour upon request and it will be available for $70 plus tax at the end of the tour. Prices are subject to change. Pregnant women are allowed up until the 7th month of pregnancy. Wheelchair access is only available to guests who are driving out to the Shark Shack. Transportation vans do not have wheelchair lifts. The cage divers are broken into 2-3 groups and will spend their next 20 terrifying minutes staring face-to-face with razor sharp teeth. Depending on passenger count, size, and ability, we may place up to 8 people in the cage comfortably. We have handle-bars inside the cage on all sides and plexi-glass windows for clear and unobstructed views. A step-ladder to allow easy access. What is the possibility of the shark getting into the cage? This has never happened in North Shore Shark Adventure's 11 years of operation. Sharks have never shown interest in entering the cage. Although the sharks you see, mainly Galapagos sharks, are large, they are more interested in eating the fish. How long are you in the cage? You will be in the cage for approximately 20 minutes, offering plenty of time to get up close and personal with the sharks. The metal cage is 9 feet by 8 feet wide and 8 feet tall (deep). There are handle-bars inside the cage on all sides and plexi-glass windows for clear and unobstructed views. A step-ladder is available to allow easy access. How many people can fit in the shark cage? Cage divers are broken into 2-3 groups. Depending on passenger count, size, and ability, we may place up to 8 people in the cage comfortably. We recommend booking at least 1-2 weeks in advance. If you have very specific schedule requirements and are not flexible, please book sooner. Last-minute availability is often possible, but limited. Abunai is a custom designed 47-foot aluminum boat and only two years old. Seats 28 passengers but a maximum of 24 for passengers are allowed for the guest's comfort. Padded seats and backrests are available for comfortable seating. Kaiou is a custom designed 35-foot aluminum boat and only two years old. Seats a maximum of 19 for passengers. Padded seats and backrests are available for comfortable seating. Anela is a 32-foot Anderson boat and the heart of the company. One of the original boats in the fleet and seats 15 passengers but a maximum of 12 passengers are allowed for the guest's comfort. This is a true fishing boat and has one of the original cages assigned to it. This boat is operated only as needed. No. The cage is a closed environment with handlebars, allowing you to support yourself in the water without swimming. How old is the minimum age to participate? Children 3 years and older can get in the cage, while all ages may observe sharks from the boat. Should you miss your tour, you will be assessed a $45.02 per person rescheduling fee to rebook the activity. It was an awesome experience! Seeing the sharks so close was amazing!